Unknown Artist - Sharp Dressed Teddy Bear! I don't know what the manufacturer could be, of this bear. He may be a one of a kind, hand made by a private crafter or artist. He has no tags. He is jointed, he is 21", and he has a sewn thread nose (not a felt patch). 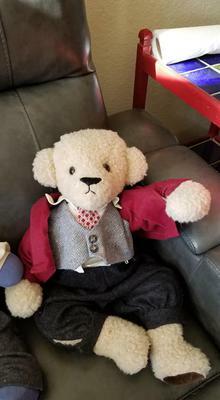 His companion at the thrift store where I bought him was a North American Bear Company "Rhett Butlear" bear, by Barbara Isenberg (c. 1979). His clothing appears to be hand made, home made. No tags in the clothing. His clothing is held in place by safety pins, here and there. Any insight as to who the wonderful artist could be, would be so appreciated! I just love him. He is a charmer!